Too old for kettlebells? Oh my back! I don't think so! 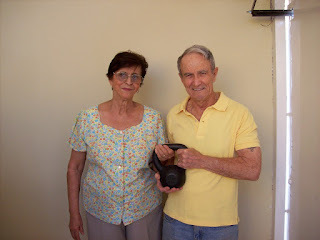 I have seen and heard great success with people training with kettlebells anywhere between the ages of 11-90 years old. I have had several emails in the last couple months from people in their 60's, 70's, and 80's enjoying the benefits of kettlebell training. As we all know, when learned properly, the benefits are endless. Many people past the age of 50, that I have spoken to, tend to be intimidated with kettlebell swings. The first thing I hear from them is, "I don't think my back can handle that" or "My back is not strong enough to do that type of movement." It's very sad when I hear these statements only because I try to explain to them that when eased in to a kettlebell program their weak back will get stronger, which will help avoid injury in the long run. My own mother has had back problems for years!! She hurt her back 35 years ago from lifting people out of wheelchairs. Since then she has always been extremely cautious when it comes to her back which has left it very weak and fragile. Naturally, she was very intimidated to give the kettlebell swing a try. I only want the best for my mother so I would never have her do something that would hurt her. She decided to trust me (it's always hard to get your own family to do something). To start, I went through a simple swing progression session with her. First starting with a proper deadlift, then slowly teaching her a proper hip snap with no kettlebell, and finally adding the kettlebell. This all took place in a matter of 20 minutes. By the 25 minute mark she was comfortable swinging a 26lb kettlebell. My mom is only 105 pounds, she's a very small lady, so that was very impressive. She was so happy that she didn't want to stop. I had to tell her to put the bell down so we could see how her body responded the next day. The next day came and she told me her back never felt better! To hear these words just proved to me again that kettlebells are not the enemy for a weak back. You will only strengthen and protect your back muscles. Of course when done incorrectly it can be detrimental to your body. Like anything done wrong. That is why it's so important when starting out to really make sure you have proper form and ease yourself in to a program. But how do I get them and how long would it take in western Mexico? Up popped your article, ¨THE NEED TO TRAIN LIKE A MAN,ESPECIALLY IF YOU ARE A WOMAN¨ Basic,clear and to the point! My wife and I are öld fölks, she in the 70´s, and this year I will be 80. Have exercised most of my life, begining in the service and up till now focused on Pushups and Pullups. The Reps got longer and the time too. With your help, I can do pretty much what I need in 30 minutes, three times a week. Just wanted to thank you and if sometime you have a workshop, Please let us know. This here proves that kettlebells can be done at any age. I could not be happier with the career path I have taken. I love what I do and I love hearing and seeing the positive influences and changes in peoples lives. Here is a link to my DVD "The Ultimate Body Sculpt and Conditioning with Kettlebells" if you want to learn how to use kettlebells properly or improve your form. Not everyone lives nearby a qualified kettlebell instructor, therefore this DVD is the next best thing.